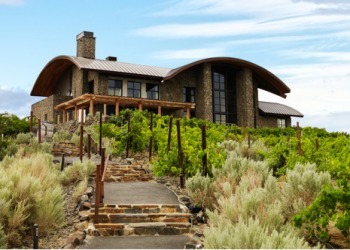 Cave B Inn & Spa offers breathtaking views of our own estate vineyards, the Columbia River and the state's most dramatic gorge location. Cave B Inn offers 55 guestrooms, including 15 stand-alone Cliff houses, 12 Cavern Rooms, three Inn Suites, and 25 Desert Yurts, as well as Tendrils Restaurant, The Spa at Cave B Inn, award-winning Cave B Estate Winery, and a dramatic cliffside outdoor swimming pool. Come for a weekend, a true Washington State vacation, for a romantic getaway, or for a concert next door at the Gorge Amphitheater. 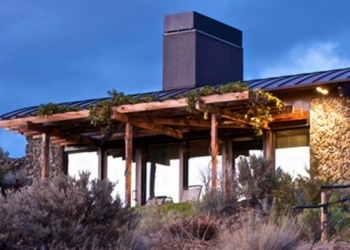 Experience outdoor adventure, one of the few estate wineries in Washington State, and a landscape like no other at one of the Northwest's finest resorts. Cave B Inn & Spa has a variety of accommodations to choose from that all offer an extraordinary experience. Whether you choose to getaway in a private Cliffehouse, a Cavern room that you enter through the cave-like basalt rock wall, one of our three Inn rooms, or a rugged back-to-nature Desert Yurt, we know you'll come back often and try them all. We pride ourselves in taking advantage of the land and its rugged natural splendor, while providing a luxurious and sophisticated, yet comfortable and laid-back ambiance in our Cliffehouses, Cavern, and Inn rooms. 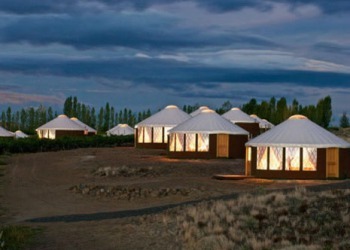 Are the Desert Yurts for you? If you are looking for an environmentally-sensitive, back-to-nature experience that is similar to camping but with a few more of the comforts of home, then yes. Our Desert Yurts will provide a king-size bed and an in-Desert Yurt bathroom, but you will hear your neighbors and the wildlife, and sometimes even the concert happening right next door at the Gorge Amphitheater. And the pathways aren�t for your stilettos ladies! But it�s an experience not to be missed if you want to see the vineyards outside your door, and the stars above your head. In 1980 Seattle-based neurosurgeon Vincent Bryan II, along with his wife Carol, purchased a several-hundred acre parcel of land high on the cliffs above the Columbia River. The closest town was Quincy and the nearest paved road was interstate 90, six miles away. The Bryans had been on a year-long quest to find land in Washington State which was similar in latitude to the great wine-growing regions of France, and which had tremendous variety in both soil and microclimate. They were looking, after many years of research and planning, for land which had nearly perfect conditions for the growing of grapes. When Vince and Carol Bryan chose this land for their vineyards, they immediately saw that they had also received much more than they bargained for. They were now in possession of a piece of land which was extraordinary in its natural drama and beauty. To have such amazing conditions for the growing of premium wine grapes, coupled with a location so stunning in its sweeping, panoramic gorge cliffs, valleys and views, was extraordinary. There was no mistaking it. But the goal was the vineyards and the Bryans immediately set to work planting on this land which until that point had only seen the grazing of cattle and the growing of alfalfa. And shortly on the heels of these first plantings came the first winery: Champs de Brionne. At this time Washington State was not the many-wineried state it is today. There was the biggie (Ste. Michelle) and a handful of others. Estate wineries - those who used only their own, estate-grown grapes in the making of their wine - were even more rare. That was the ultimate goal: to ultimately have a premiere estate winery. The excitement of possibility was in the very air; nearly palpable. The soils and the microclimates gave the promise of potentially great wines. The beauty of the location was clearly recognizable as special. Yet few even knew of this one winery "in the middle of nowhere," as the papers tended to write, or of the awe-inspiring gorge views at its doorstep. How to introduce Washingtonians to Champs de Brionne wines? How to get them to come? Fairly soon the "little gorge" was to hear its first music; to hold the sound within its naturally-curved cliff walls and send it back out to a listening audience. It was not fancy: a small wooden stage, and a few hastily-laid sod terraces. The sole intent of the "amphitheater" was to provide a wonderful musical experience that would draw visitors to Champs de Brionne Winery. As summer approached pamphlets were written up and dittoed into damp, inky-smelling piles. The Bryan children handed out these "Champs de Brionne Summer Music Theater" pamphlets at the end of the dusty, unpaved road leading past the winery. And, to everyone's amazement, they passed out 1,000. It was clear: the amphitheater, with its amazing sound, its jaw dropping views of flood-carved cliffs and ribbon of grand blue water stretching off into the horizon, was a very special place. Guests came, tried Champs de Brionne wines, sat on the grassy terraces and enjoyed themselves tremendously. Quickly the amphitheater grew to include a much larger stage and an increasingly exciting line up of performers... the fact that the Bryan family had to vacate their summer trailer to turn it over to these early performers didn't matter: it was exciting to the Bryan children that people like Chuck Barry had just sat on their couch; eaten at their dining room table. The Champs de Brionne Summer Music Theater was gaining momentum. This land seemed to elevate everything and everyone around it, and with that understanding came the decision to close the winery and concentrate on making the estate vineyards larger, more mature, more select in making them a match to their surroundings. 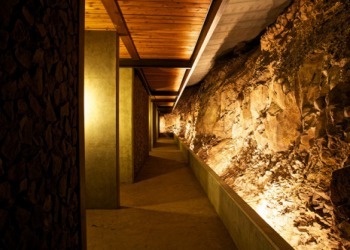 Then and only then would a new, smaller, boutique winery be built.